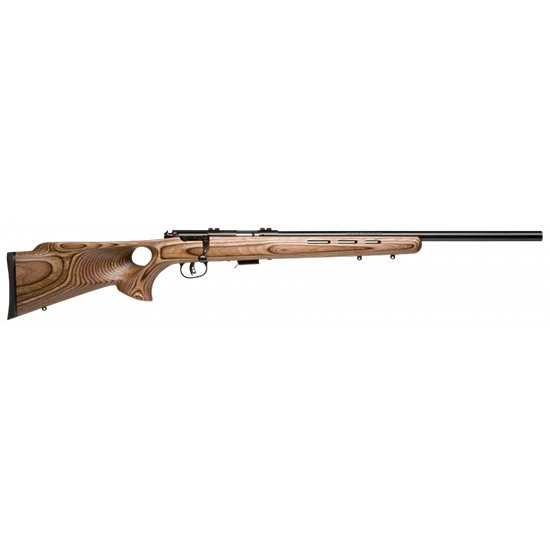 Savage 28750 Mark II BTV Bolt 22 Long Rifle 21 5+1 Laminate Thumbhole Brown Stk Blued in. Mark II rimfire rifles add more fun to shooting than almost anything else for the money. From casual plinking to serious hunting this versatile rifle can handle it all with matchgrade accuracy. Mark II BTV and BTVLSS the lefthanded stainless steel version provide everything you want in a boltaction 22 repeater including a longrange heavy steel barrel for precision shooting. The detachable box magazine and 21 steel barrel are set in a laminate stock with a beautiful satin woodgrain finish and a Monte Carlostyle comb. AccuTrigger the shooteradjusted trigger from Savage is a standard feature for nocreep crisp trigger pulls and enhanced accuracy while allowing noncompromising adjustability with no gunsmithing. BTV features a blued carbon steel barrel while BTVLSS has a stainless steel barrel and is situated for lefthanded shooters."